The disease is thought to have spread from China in the early 2000s. Citrus greening has already destroyed the citrus industry in Jamaica, and has recently been detected in California and Texas. Figuring out how to culture the bacterium in the lab is a critical step in understanding its life cycle, its weaknesses, and what can be done to stop its spread. Gang’s WSU team includes Anders Omsland, an international expert on culturing the otherwise unculturable. Attempts to culture Liberibacter to date have involved all the usual—and a few unusual—techniques. The basic approach is feed the organism something to feast on and, all things being equal, watch it reproduce like mad. None of that has worked—not even the grapefruit juice diet one researcher thought might do the trick. Omsland, though, is undaunted. He has cultured some recalcitrant organisms, including Q fever, which hits sufferers like a very bad—and potentially fatal—case of the flu. And he’s close to culturing the sexually transmitted bacterium, chlamydia. Liberibacter and the bacteria that cause Q fever and chlamydia have something in common. They’re all types of parasites that invade host cells. Parasitic bacteria often only divide in the cells they invade, thus presenting researchers with a tough challenge. It took Omsland four years to culture the Q fever-causing bacteria—but that’s nothing, as something like 99 percent of all bacteria remain unculturable in the lab. Another member of Gang’s team is chemical engineer Haluk Beyenal, who is investigating the possibility that Liberibacter is defending itself during the dry season as a biofilm. Instead of always floating freely in a liquid, bacteria like to wrap themselves in a slimy mesh of sugars, DNA fragments, and proteins. The resulting film coats a handy surface—such as the inner surface of an oil pipeline, where it corrodes infrastructure, or the surface of our teeth, where it causes decay. Gang says his team conjectures that a hypothetical Liberibacter biofilm may cling to the roots of citrus trees, avoiding desiccation. In this scenario, once the rains (or, in California and Texas, the irrigation waters) return, the bacteria spread through the trees’ vascular systems, creating havoc as they go. Liberibacter is not only a pathogen of citrus trees, but of its vector, a tiny insect called the citrus psyllid, as well. Infected psyllids live fast and die young. So one way to beat Liberibacter might be to develop a “nupsyllid”—a new variety of Asian citrus psyllid—that doesn’t transmit the bacteria. Such a psyllid would be healthier and would out-compete, and then replace, populations of infected ones. Time is of the essence for citrus and growers are depending on researchers to find a way to stop the damage caused by Liberibacter. 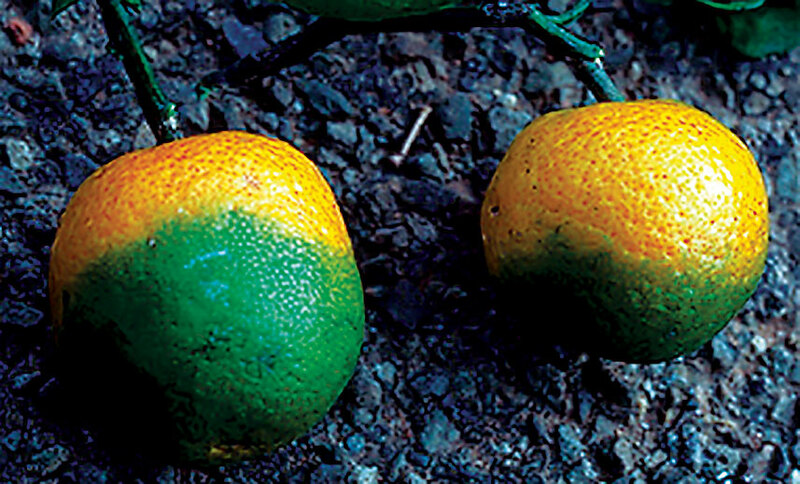 Gang and the team are determined to save citrus, with millions of orange and lemon lovers rooting for a solution, as well.